For the duration of their 7-year career, CocoRosie have been criticized and loved with equal fervor. To some, everything about the sisterly duo reeks of art school pretension, from their lyrics to the images they conjure of feathered hairpieces and child-like watercolor paintings. To others, it takes true wordsmiths, visual pioneers, and experimentally-curious individuals to craft music like CocoRosie’s in the first place. If critics and lovers are ever to converge on an opinion about CocoRosie, the duo’s latest album, Grey Oceans, might be the starting point. It is a synthesis of their alienating experimentation with more traditional textures and melodies. This time around, CocoRosie seem to place a much larger focus on percussion and creating an overall rich, comforting ambiance. Noises now hide beneath core instrumentation rather than dominating the landscape, and Grey Oceans simply feels much more pedestrian than the sisters’ previous works. Only the two closing tracks, “Fairy Paradise” and “Here I Come,” stand out as especially disjointed; they break down into odd trance beats and utilize lethargic vocals, respectively. At times, however, the lyrics become unintelligible. It is then that vocals reach beyond words into an emotionally-felt realm of sorrow. “Undertaker” opens with Antony And The Johnsons-eque wailing — a sample sung in Cherokee, courtesy of their mother. “Smokey Taboo,” aided by tribal drums, sounds again like a Native American lamentation. Still, though, CocoRosie are vocally just as polarizing as they’ve always been. On ballads like “Gallows,” they sound like a cross between withered grandmothers and speech-impaired youngsters, with vocal crackling and word slurring that’s equally obnoxious and endearing; it all depends on who’s listening. 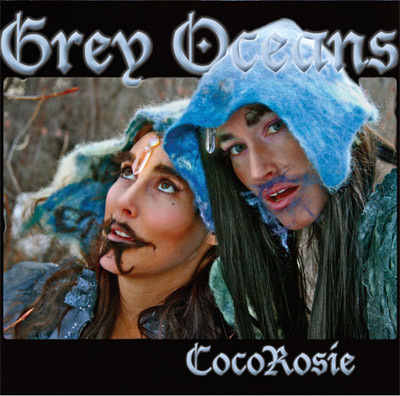 Grey Oceans is CocoRosie’s first release in three years and their first for Sub Pop Records. It should introduce them to a new generation of audiences, in a time where the market is more tolerant of experimental musicians than ever. But just the same as always, they are bound to polarize listeners with this release. The only difference is that there might be a lot more people on their side this time.